Summer is finally here and hot days are soon to follow. These drinks add a nice touch to a small group dinner or just nice to serve while hanging out. I'm not using the standard layout because they don't have any complicated steps. It's 1 scoop of sherbet for every cup of lemon lime soda. 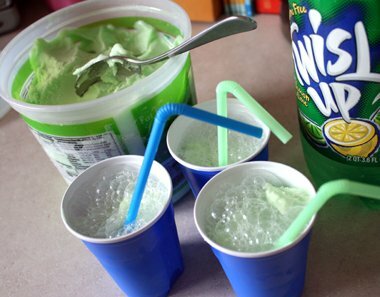 You can start with a 1/2 gallon carton of sherbet and add (2) 2-liter bottles of lemon lime soda and stir. Adjust as needed. You can use any flavor of sherbet and substitute 1/2 seltzer water to make it less sweet. Orange cream soda: This one is really easy too and tastes just like the orange cream popsicles we had when we were kids. Just blend vanilla ice cream and orange soda. Some people say it tastes like an Orange Julius. Strawberry Lemonade Take some frozen strawberries and blend with some Sunkist Lemonade to make a puree. Add to lemonade until desired ratio. Serve. I love sherbet cooler. I use sherbet with ginger ale! its great. but sometimes if u use rainbow sherbet, the drink looks like bathwater. hahaha! still taste good tho. - hawaiian punch with sherbert works great too.